Today was the mother of all storms so far this winter(school canceled, foot of snow, horrendous winds 60+mph and now rain!) 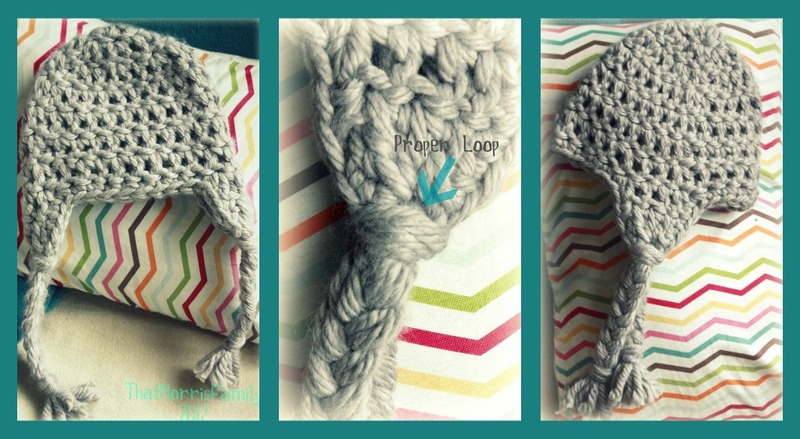 , I thought why not crochet up something cozy for an up coming baby shower(flavor not known). I know from experience that working with this chunky yarn in a very small size can yield a pointy hat so I toyed around with it a little bit and found that this method is the best way to get a nice flat round top :D Enjoy my first ever published pattern....I have more patterns in the works! I guess the apple doesn't fall too far from the tree. My mom and I operate a little Etsy shop BendBeanies.etsy.com (she writes patterns, I occasionally sell finished items - if I ever finish them ;) But it looks like I am moving on to writing patterns as well! This was fun and if you try it let me know how it turned out!!! This works up in less then an hour!!! Row 2: Ch2. 2DC in each DC around (16DC) Join with slip stitch. Row 3: Ch2. *DC, 2DC* Repeat in each st. Join with slip st.(24DC) Join with slip stitch. Row 4: Ch2.DC in joining stitch DC in ea stitch around join with slip st. Fold in half and pull loop through between the 2 DC2tog on the ear flap and pull all 12 tails through the loop, give a good tug(making sure you yarn loops over the outside of the ear flap)refer to picture. *Finished hat should measure about 7.5 wide laying flat and 6 inches tall(not including the ear flaps) Adjust hook if needed.